Photographer Tyree, Macey et al. 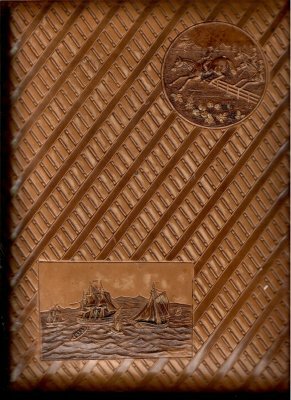 Description Large leather bound hard covered photograph album, embossed on the front with diagonal lines and images of horses jumping in the top right and sailing ships bottom left on the front cover. Inscribed on the first page, "Thos Renwick from his loving [removed], Xmas 1893". [Probably his loving aunt, Anne Renwick, who was a widow in 1893 (Dr. Thomas Renwick died in 1879). Dr. Renwick adopted his nephew, Thomas Junior, and Thomas Junior, aged 25, took over Dumgree in 1890, but junior had a health problem and about two years later Anne Renwick had to take over Dumgree again. Thomas Junior lived on the property as sub-manager until his death in London in 1925. Contains a large number of portraits from a number of different photographers. Two hand-written pages (one is headed "Rough copy") list the pages and attempt to name the people. It is unknown who wrote these lists. They are headed: "Thos Renwick (secundus) of Dumgree photograph album Xmas 1893". The pages have been catalogued separately starting at 0000.009.0109.